In front of us, a few hundred shorebirds were focused intently on foraging for food. 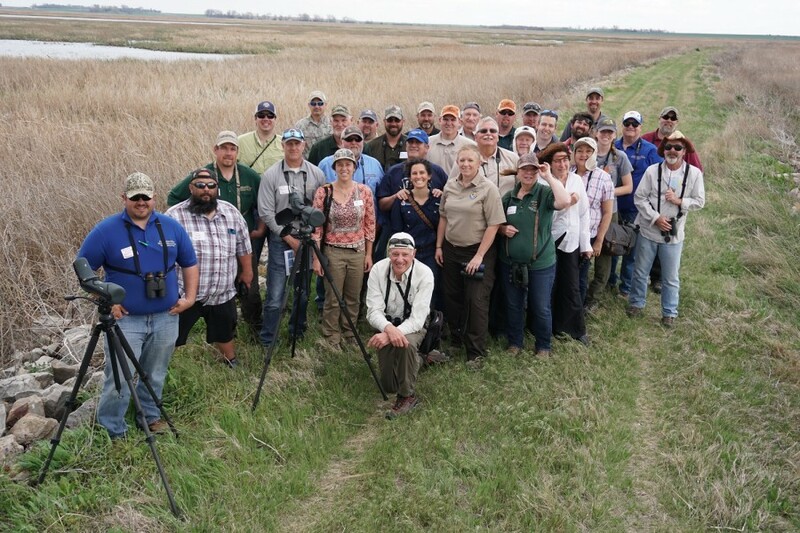 We were in the center of Kansas, for Manomet’s Shorebird Conservation Action Symposium at Cheyenne Bottoms. 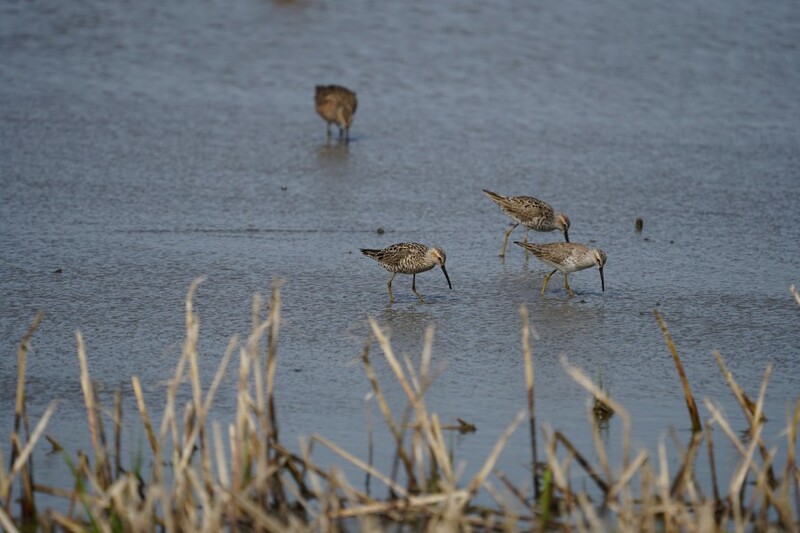 Some of us were practicing estimating flock size on a large group of Long-billed Dowitchers and Hudsonian Godwits. Some were learning to tell the difference between a Baird’s and a Semipalmated Sandpiper for the first time. 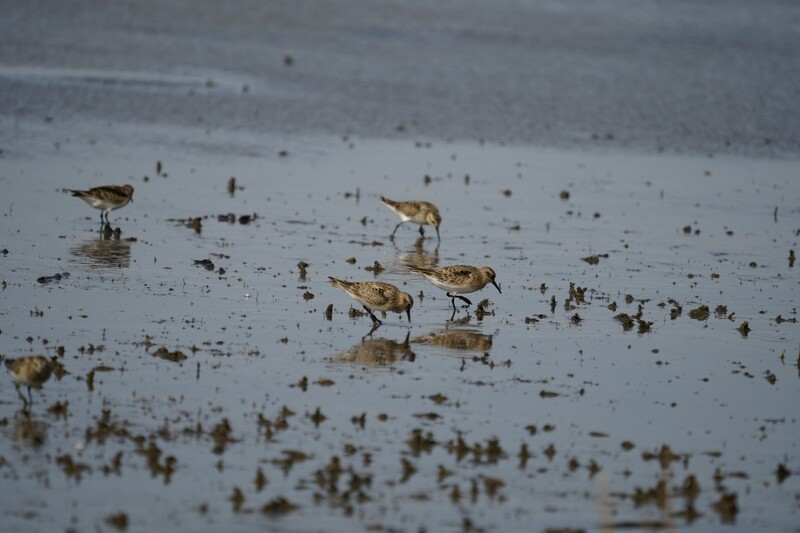 Baird’s Sandpipers. Photo by Maina Handmaker. But the sky behind us had turned a thick, hazy gray – and the air was eerily calm after a barrage of 30-40 mph winds. Anyone from Kansas would tell you – this was the “calm before the storm.” Most of the species before us were making their way back to their high-arctic breeding grounds after a winter in South America. And this large basin in the prairies of the United States is one of their crucial rest-stops along the Central Flyway. To budge the 33 Symposium participants busy counting and identifying the birds – not to mention to move the birds concentrated on eating, that storm was going to have to get a lot closer. Luckily it skirted to the east, and we closed day one without having to brave the tornado we’d seen brewing in the distance. Flock takes flight. Photo by Maina Handmaker. Cheyenne Bottoms is one of the largest interior marshes in the United States. It has been a Site of Hemispheric Importance in the Western Hemisphere Shorebird Reserve Network (WHSRN) for 30 years, and the symposium celebrated this milestone by presenting certificates to the site partners. 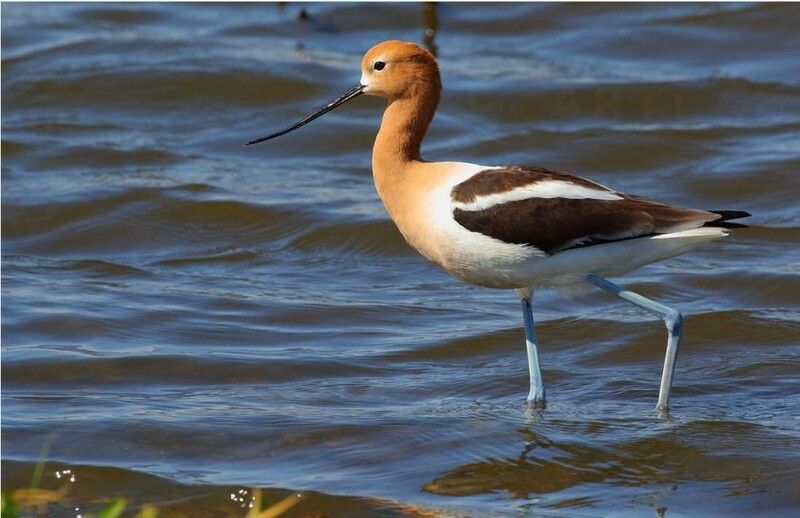 Migratory shorebirds passing through the mid-continent are subject to unpredictable weather patterns and a landscape of ephemeral wetlands in which to find their food. 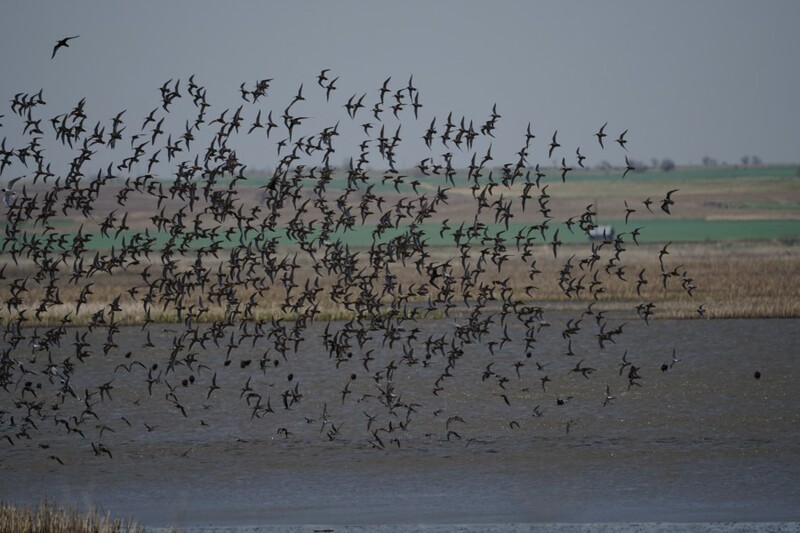 Water levels at Cheyenne Bottoms still vary on a regular basis, but the basin provides some of the most reliable food resources for shorebirds migrating through the center of the continent. Foraging Stilt Sandpipers. Photo by Maina Handmaker. Of the 52 shorebird species that occur in North America, 37 are found in the Great Plains – and half of these species are considered of high conservation concern or worse. Manomet’s Habitat Management Division and Robert Penner of The Nature Conservancy of Kansas organized and led the symposium that brought together managers of public and private wetlands, employees of the Kansas Department of Wildlife, Parks, and Tourism, representatives of Ducks Unlimited and other non-profit organizations as well as National Wildlife Refuges from the surrounding states of Nebraska, Missouri, and Oklahoma. 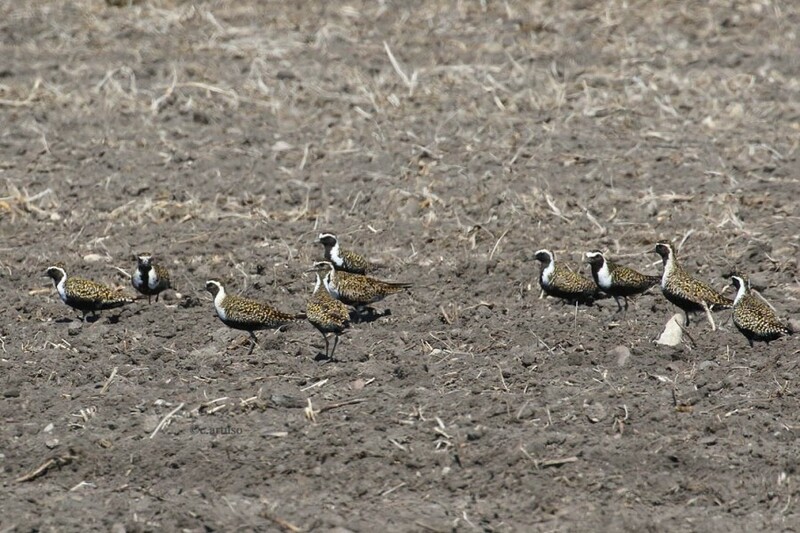 Kevin Teneycke, Director of Conservation for Nature Conservancy Canada, traveled from southwest Manitoba to share their shorebird conservation efforts in the Canadian Prairies. 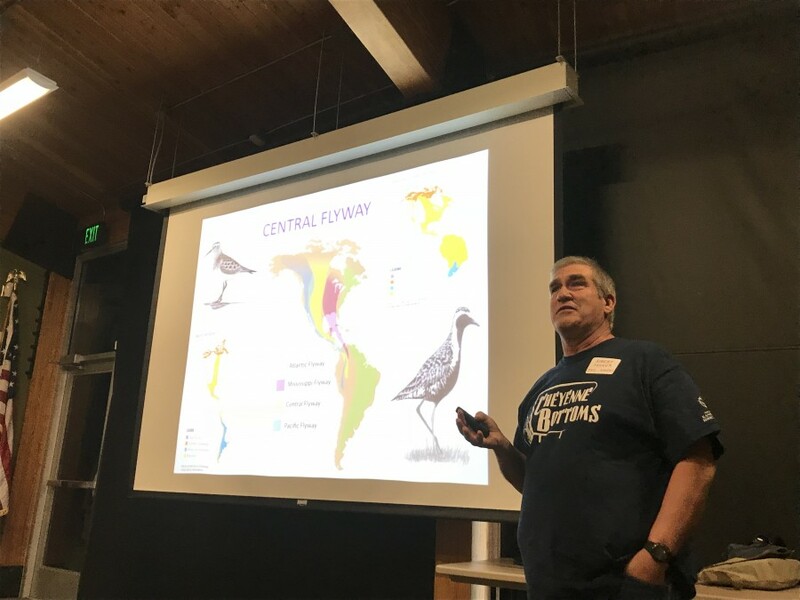 Manitoba was next on the docket for a Manomet Habitat Management workshop; a few weeks later Robert Penner would travel to Canada and he would share a presentation about Cheyenne Bottoms, thus beginning a learning exchange between these two Central Flyway regions. Robert Penner presents. Photo by Monica Iglecia. Group discussion. Photo by Maina Handmaker. 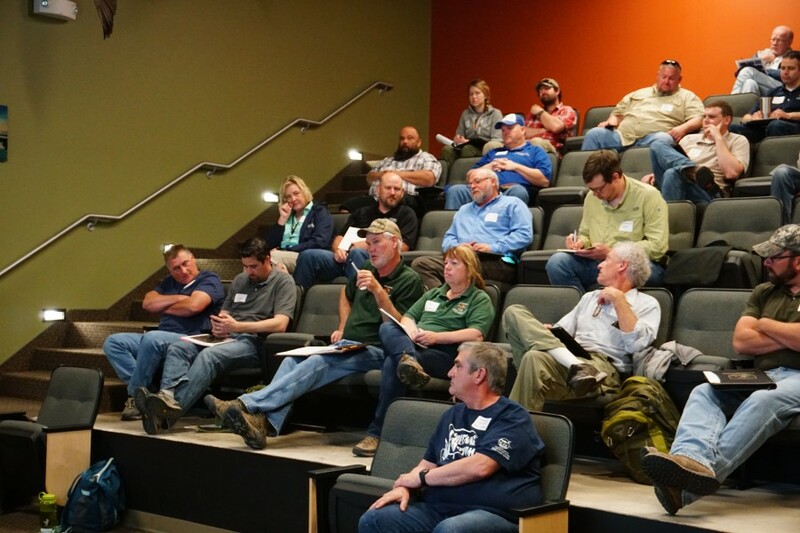 The three-day workshop focused on techniques for “managing with multiple priorities.” Cheyenne Bottoms provided an ideal case study: a diverse matrix of habitat management techniques are needed to weave shorebirds into management plans. At a site where shallow-water dependent shorebirds overlap with shorebirds that rely on drier grasslands, a management plan needs to provide habitats that suit them all. 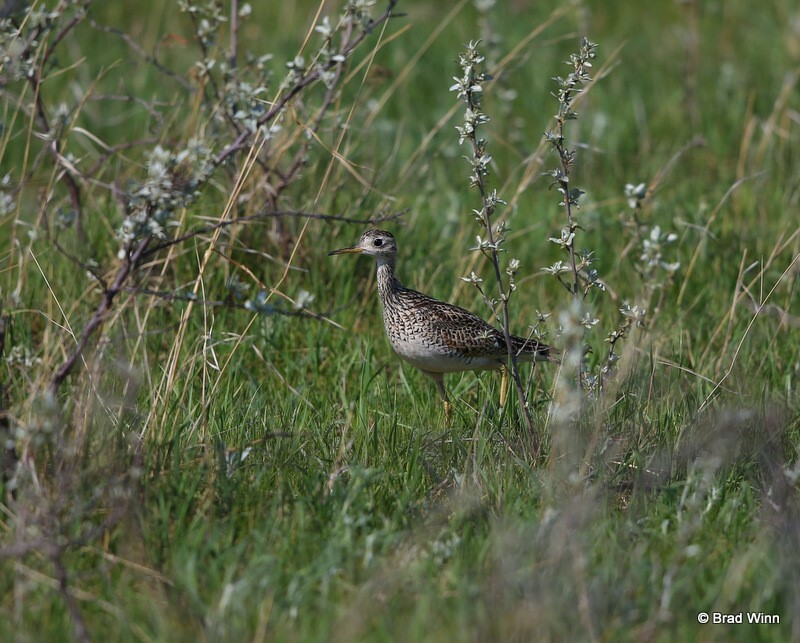 When The Nature Conservancy rotates between mowing, haying, grazing, and prescribed burns it helps to maintain short and sparse vegetation preferred by upland shorebirds like Upland Sandpipers – and it helps to reset the prairie landscape, much as the large herds of American Bison and natural fires used to do. 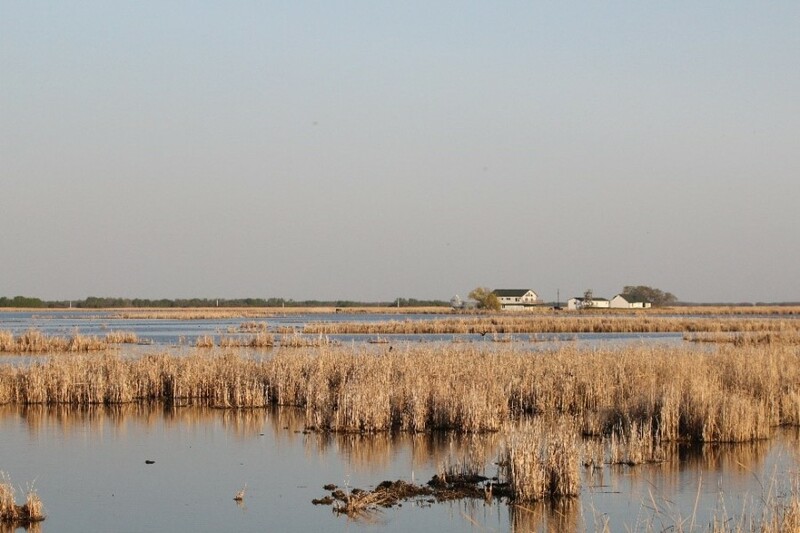 In other areas of Cheyenne Bottoms that are principally managed for waterfowl, water levels can be brought to levels that satisfy the habitat needs of shorebirds that arrive before most ducks. Group estimates phalarope flock size at Quivira. Photo by Maina Handmaker. Day two’s field trip was to Quivira National Wildlife Refuge, a WHSRN site of Regional Importance. Quivira combines a unique array of sand prairie, freshwater wetlands, inland salt marsh, and playa habitats – and it is one of the four most important nesting sites for Snowy Plovers in the Great Plains. It was here that workshop participants witnessed shorebirds at work with waterfowl. We watched hundreds of tiny Wilson’s Phalaropes – a member of the only group of shorebirds that can swim – forage behind the much taller shorebird the American Avocet, and the much bigger duck, the Northern Shoveler. Phalaropes are known for their behavior of swimming in circles to stir up invertebrates in the water column. Shovelers stir things up too, using their shovel-shaped bill to forage head-first in shallow wetlands. Were these phalaropes swimming in the wake of the shovelers to eat the invertebrates they brought to the surface? 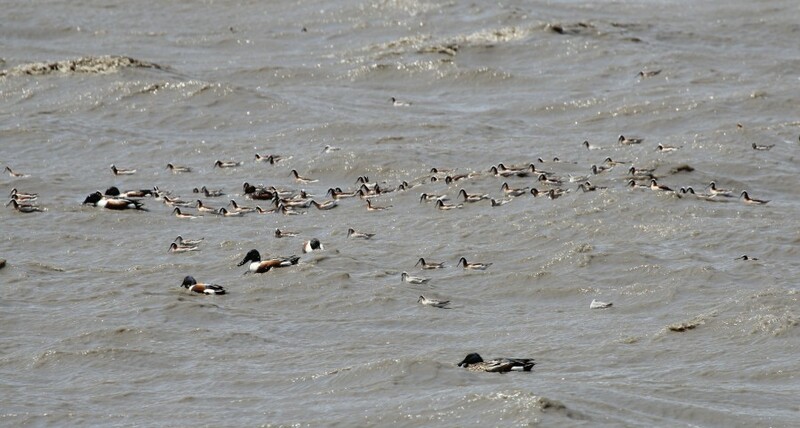 A “sea” of Northern Shovelers and Wilson’s Phalaropes. Photo by Monica Iglecia. Flagged Semipalmated Sandpiper. Photo by Jason Olszak. Looking out at the mudflats of Quivira, a subtle flash of yellow struck someone’s spotting scope. 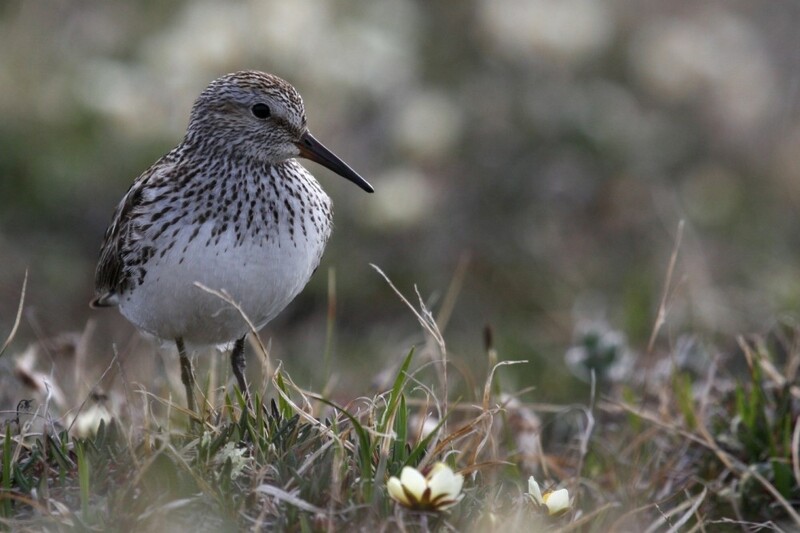 In a blur of small brown and grey shorebirds – Dunlin, Baird’s Sandpipers, Snowy Plovers, Stilt Sandpipers, and Sanderling, to name just some – a Semipalmated Sandpiper was spotted with a yellow flag on its leg. Its red letters read “8AC,” making it possible to trace this bird to Peru. It was tagged as an adult in 2011, meaning it had made this tremendous journey twice a year for at least seven years. 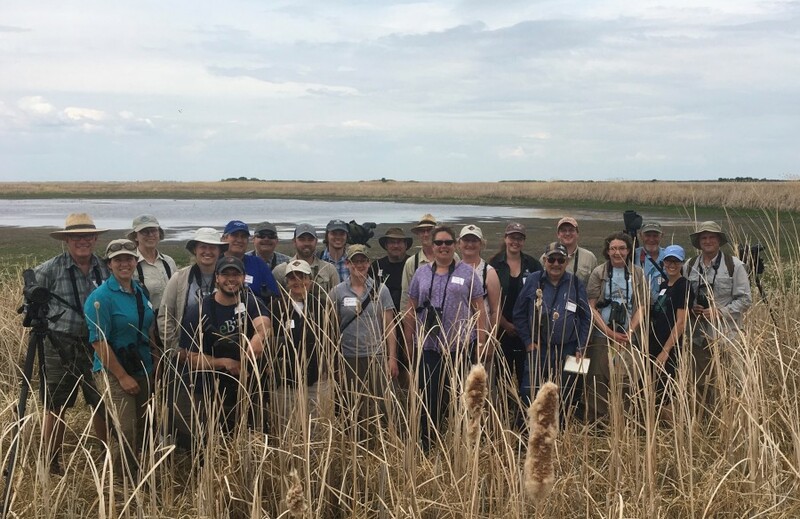 Gathered around scopes to catch a glimpse at the sandpiper from Peru, many participants commented that the connection between the wetlands of Kansas and the coasts of South America had really hit home. Group photo at Cheyenne Bottoms. Photo by Brad Winn. Written by Shilo Felton, Ph.D. When I was in college in San Diego, a professor stated during lecture that “the wild no longer exists as we think of it”. For the most part, he was right. What we think of as wild places are indeed heavily touched by humans. This isn’t necessarily a bad thing—conservation of vulnerable plant and animal communities relies on the influence of natural resource managers. But I think a lot of us dedicated to conservation pursued this path, not just for the love of the animals, but to preserve wild places. It was more than a little disheartening to hear that this could be a myth. 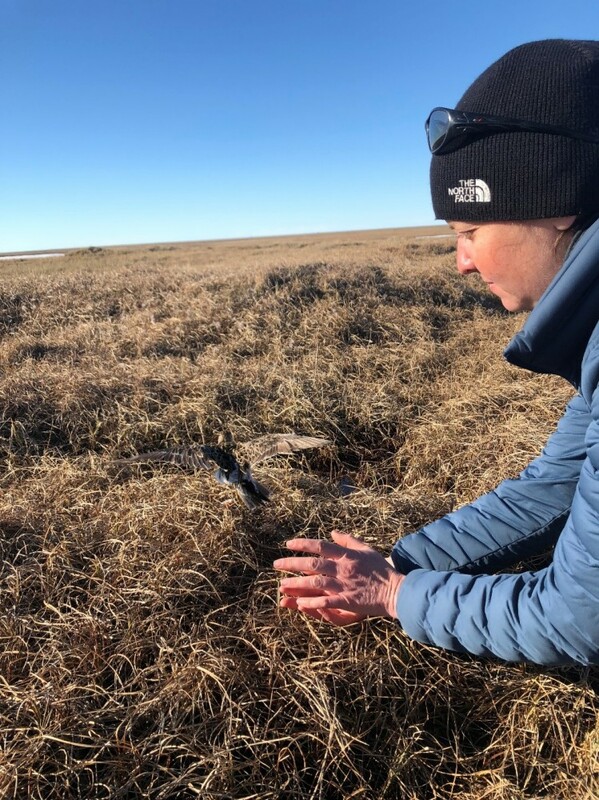 Two weeks before I defended my Ph.D. Dissertation (many years later), Manomet’s Shorebird Recovery Coordinator, Shiloh Schulte, invited me to take a break from the warmth of North Carolina to help with shorebird research in the Arctic. His text read, “I might have a job for you for a couple months, depending on how much you like the cold…Also, I should warn you about the mosquitos…” I am not a huge fan of cold (or mosquitos, but who is?). “I’m in!” I said. Tell him I hate cold and miss my chance to see shorebirds breeding in Alaska??? I don’t think so. Perhaps this was where the myth of real wilderness lived on. He wasn’t joking about the cold. I slept in two sleeping bags – one graded for -40°F and another for +15°F, and my toes were still cold. The first few days hiking out from bird camp, sloshing through snow and wet tundra marsh in my hip waders, my toes hurt from the wet cold surrounding my neoprene covered feet. I managed to get mild frostbite in places I didn’t realize one could suffer from frostbite. But I was finding Pectoral Sandpiper nests and searching for tagged Semipalmated Sandpipers. The cold was worth it. On what started out as a clear, relatively warm day (i.e. just above 36°F), Schulte and I decided to make a trek up the Canning River in search of American Golden-Plovers. Only one pair had nested within our study area and it had already been depredated – likely by a jaeger. From his experience the year before, Schulte knew of another potential hotspot about six miles away. This was a break in the wet cold we had been experiencing, and the snow that had been hanging on four weeks past its due had finally melted away. We were going to use this opportune weather to leave the safety of camp and tag Golden-Plovers with GPS satellite backpacks. We carried bear spray and shotguns for safety and radios in case we wandered a little too far away from one another (we wouldn’t be able to contact camp from the distance we were going). Schulte packed up two lunches for each of us – we were planning for a long day. It was an easy morning to cross the river – about knee-deep and the current mild. As we passed over a shallow river island, I flushed a nesting King Eider female – six eggs. We marked it and kept moving across the river. On the opposite bank, we checked on a few Ruddy Turnstone nests that we had discovered on the river beach the week before. Schulte pointed back toward the river at a small peep that landed on the shoreline. “Look!” he said. “A White-rumped Sandpiper!” I was lucky I was walking with someone who could distinguish this bird from Semipalmated Sandpipers by its white eyebrow and thick white patch on its rump. We eventually made our way to higher, dryer ground. We separated from each other by about 50 meters, walking in zigzag patterns to maximize our chances of flushing any shorebirds sitting tight to their nests. This was less important for our target species Golden-Plovers, however, as the parents would alert us of their presence from 20 meters away, with their slow melancholy piping. Schulte and I were not walking together, but we checked on each other frequently for safety and communication. At one point I looked over to see him marching slowly toward me holding a set of giant caribou antlers to his head – a bit of comedic relief made possible when he found two perfect antlers that a caribou had managed to shed simultaneously. I chuckled, shook my head at him, and kept hiking. I stopped to scan the horizon – a grizzly bear slowly ambled North. He was a beautiful golden-colored male with a dark belly, and his small ears relative to his head gave away his very large size. He was far enough away that we were in no danger, but Schulte and I decided to walk together for the remainder of our trek. We carry deterrents, but the best way to prevent using it is to walk with other people. This was a reminder to me of our remoteness. We carry protection for bears, but other dangers are more likely: a sprained ankle from hiking the uneven tundra lumps, a mild cut from the ice that won’t heal, hypothermia. In this wilderness, there is no one to call for immediate help. We rely on ourselves and the equipment we carry with us. It is incredibly heavy, but worth the effort. In an emergency, we could call for an airlift, but the weather must be amenable to landing a small bush plane or helicopter. This year, good weather days had been few and far between. Schulte spotted an Arctic fox staring at us from its mound, and a couple small faces peeking out indicated that she had cubs. A Snowy Owl gave an alarm call from another tundra mound. As we reached our destination, where the Canning met the Steese River we noticed another Snowy Owl standing watchfully atop another mound. Then another and another. Altogether we counted nine Snowy Owls within a square kilometer. 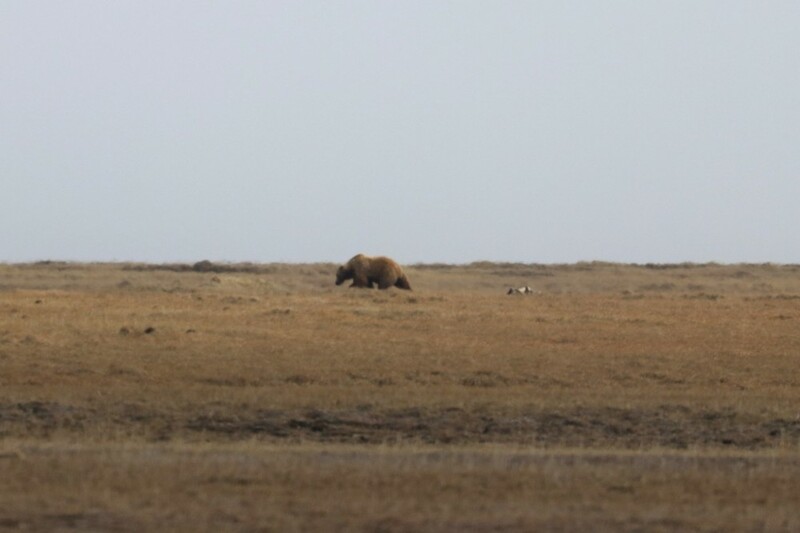 It was incredible to see so many individuals of a species I had never seen before coming to Alaska’s North Slope. They were angelic. 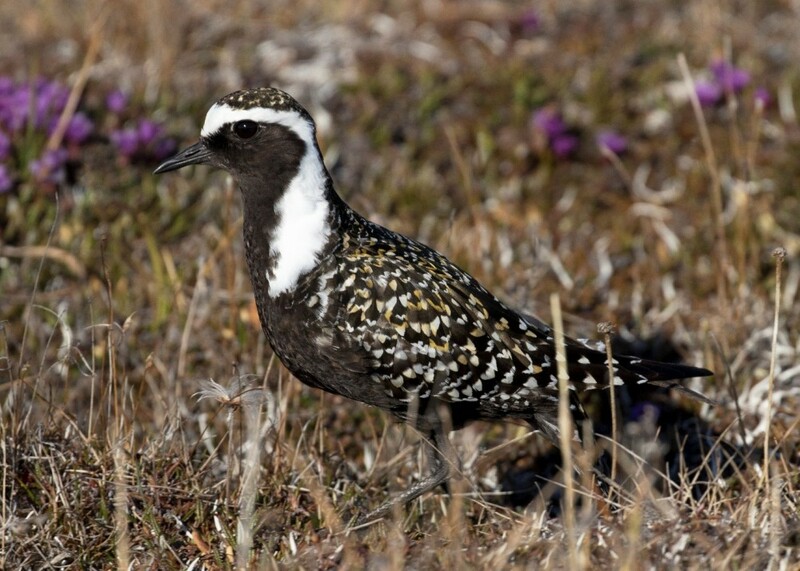 While predators were abundant, Golden-Plovers were not. We found no plover nests as we marched around the high ground where they would normally choose to lay their eggs. 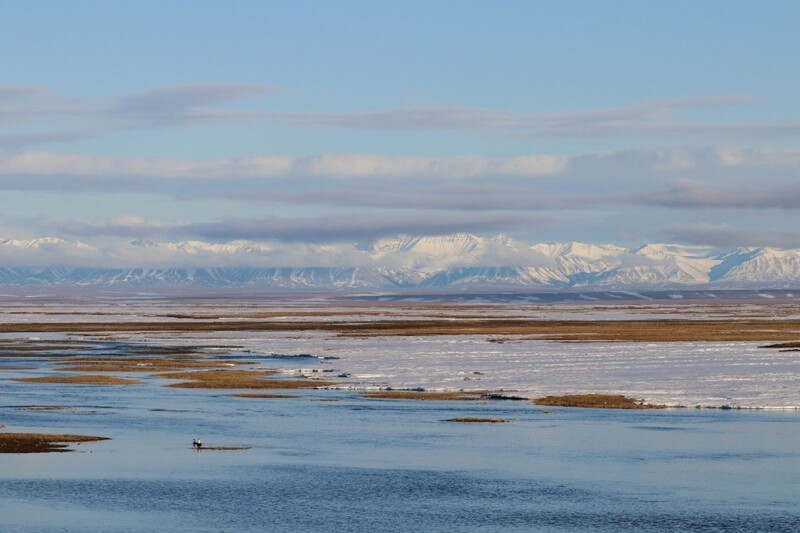 Then, looking out over the braided river, we saw one – a Golden-Plover foraging along the sandy river islands. But then we saw another next to it, and another. Breeding plovers are territorial and wouldn’t have been tolerating each other this way, even to forage. 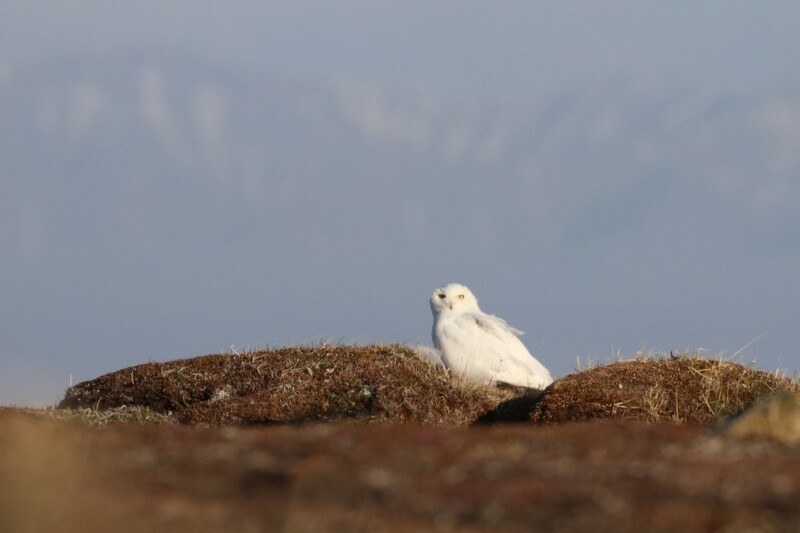 It seemed that the plethora of Snowy Owls, while incredible for us, may have been hindering the plovers from nesting successfully, or nesting at all, along the Canning River. While we were reluctant to give up hope, we still had a six-mile hike ahead of us. 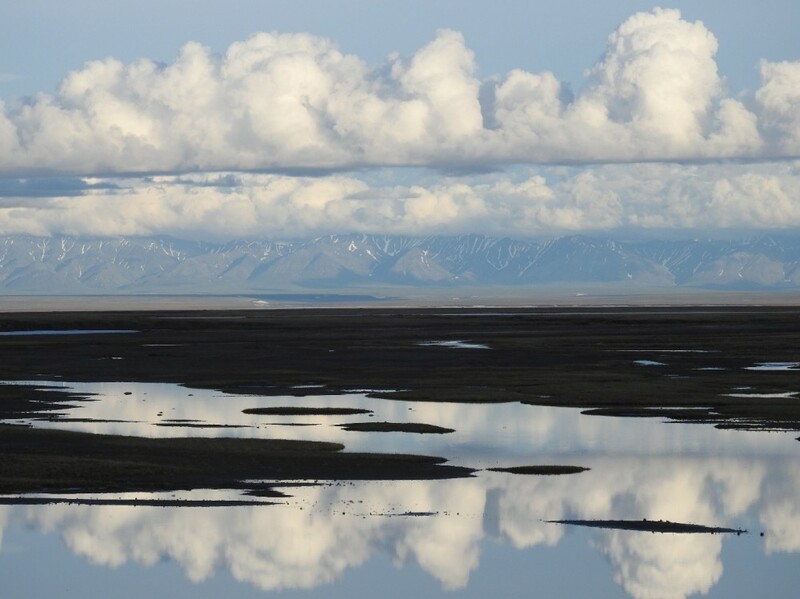 Daylight is never a limiting factor in the middle of summer in the Arctic, but weather changes frequently on the North Slope and the temperature was beginning drop as the fog rolled in. Before we began our hike back to camp, I pulled the extra layers of clothing I had packed from my bag and systematically put them on: some ski mittens over my glove liners, a puffy jacket over my fleece, and a rain shell to deflect the wind as it picked up. 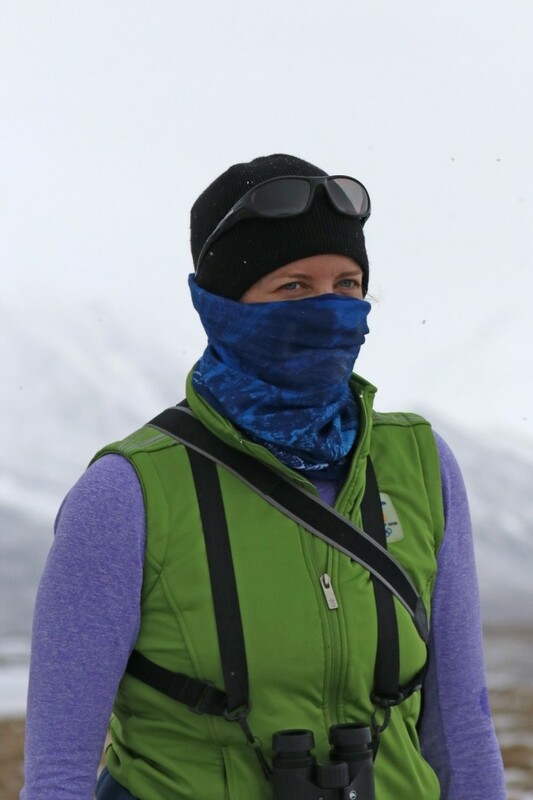 As I had gotten in the habit of doing whenever the temp dropped below freezing, I pulled the back of my neck gator up over the back of my wool hat and the front of the gator over my cheeks and nose. This kept my ears, neck, and face completely covered, except for my eyes. For some reason my fellow campers found this getting odd. I’m not sure why I was the only one doing this. I guess everyone else was accustomed to colder climates (or didn’t want to suffocate in their own neck gators). Either way, it worked for me and made the cold temperatures tolerable. Schulte, who is used to winters in Maine and a veteran to Arctic field work, put on a thin fleece jacket. A person watching us would think we were preparing for completely different climates. As we walked back, Schulte and I sighted another bear, this time only a few hundred meters away. He was scampering – not a speed I had seen in a grizzly yet. Through our binoculars, we determined the reason he was running. An arctic fox, not much bigger than the bear’s foot, was nipping at the bear’s heels! She was clearly trying to keep him away from the kits we had seen earlier. The bear treated her as one might treat mosquitos – growling and swatting at her on occasion but mostly just trying to avoid getting bitten. Eventually, he moved away enough that the fox left him alone. Closer to camp we encountered an unpleasant surprise. In the relative warmth of the morning (e.g. approaching 40°F), the snow had begun melting from the Brooks mountain range, raising the river to a level we did not recognize. Even the island where the eider nest had been was no longer visible. Camp was on the other side. We were wearing chest waders, but with the river raised it was difficult to find a crossing that was shallow enough for wading and calm enough to not knock us over. Having your chest waders fill with ice cold water is unpleasant (trust me), and we naturally wanted to avoid it. Eventually, we decided on a crossing point. (Actually, Schulte decided. I was ready to set up camp and wait for the river to subside). We worked together to cross the river. I insisted on trying a strategy that I learned from a backpacking video. Schulte faced the current and I held on to his pack to help stabilize him. Schulte quickly realized I was mostly pushing him over (unintentionally, I promise). Instead, we tried his way and linked elbows, walking side-by-side and facing our destination on the far river bank. We made it safely to the other side without flooding our waders, though we were grateful the ice at the bottom of the river had mostly melted. I got stuck a couple times in the still-feet-deep snow bank on the other side of the river, but we soon made it back to camp to warm up with some delicious tuna mac another crew member had whipped up. 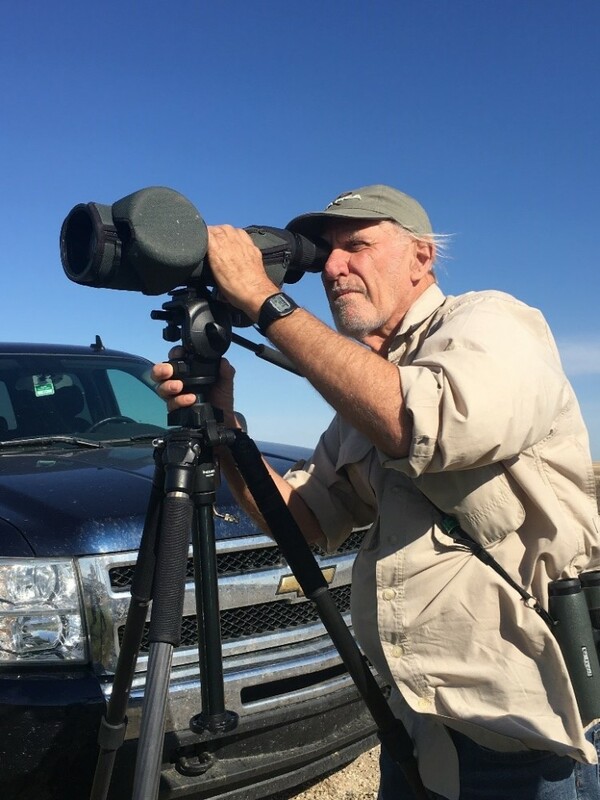 Following this trip, Schulte soon returned to the lower 48 to fulfill perhaps less exciting (though certainly no less important) obligations to shorebird conservation. While I envy his getting to take a shower and sleep above ground level, I am grateful to be in the Arctic as summer arrives (finally). 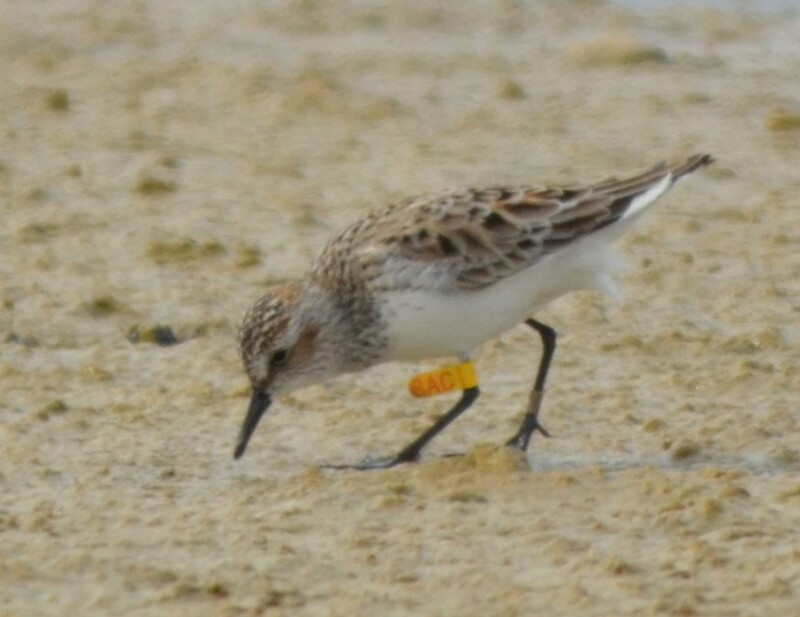 We completed our goal of tagging five Pectoral Sandpipers and sent our American Golden-Plover tags to Barrow, where breeding pairs are plentiful this year. I remain in the Canning River Bird Camp to assist the Fish and Wildlife Service in monitoring shorebird nest success, keep an eye out for any missed birds tagged the year before, and chase a Dunlin with a GPS backpack (no luck yet finding his nest, though I am convinced it exists). On a daily basis, I visit Semipalmated, Pectoral, and Stilt Sandpipers nests to find them in the middle of hatching. Tiny tundra-colored balls of fluff with long toes sit quietly in their nest cups. Dunlin peep as I approach, their chicks tiny wings outstretched as they stumble awkwardly over the tundra lumps toward the safety of their parents. As I walk north from camp along the Canning River to check on a one-egg Buff-breasted Sandpiper nest, I notice that the wildflowers are in full bloom. They seem to me to be miniature versions of our flowers in the lower 48. 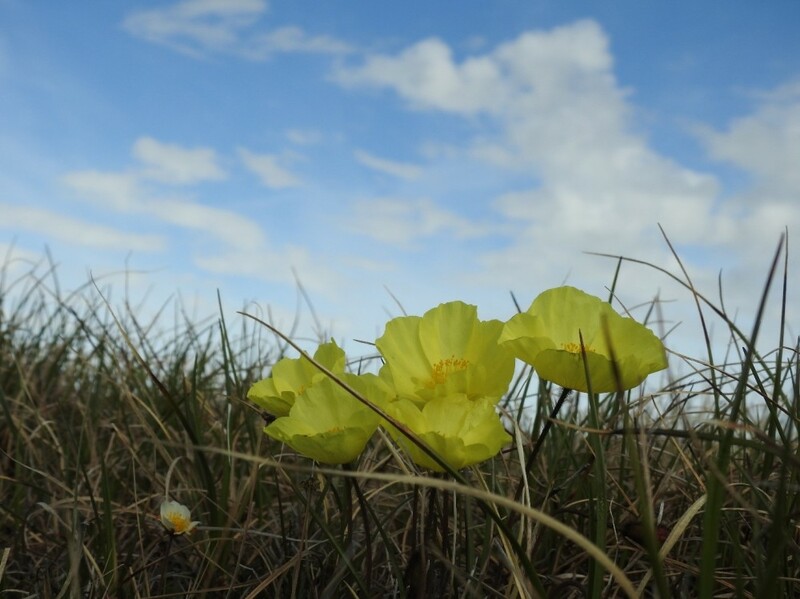 Purple mountain saxifrage, fuscia-colored wooly lousewart, yellow Arctic poppy, and white mountain aven, none more than a few inches tall, are sprinkled around the tundra floor. The mosquitos are so abundant I can’t walk more than a few meters without inhaling one, but I don’t mind them much. They accompany warmth and humidity that remind me of spring in North Carolina and they are the main source of nutrition that draws shorebirds to migrate here to raise their chicks. I hear a chirp and look up to see an Arctic ground squirrel standing erect on a nearby mound. A rumble sounds from the west – a thunderstorm making its way along the coast. In front of it, just a mile or so away from me on the opposite side of the river, I see a herd of nearly 1,000 caribou making their way for the coast to escape the mosquitos. If we are lucky, the wolves will follow them. Even as I am here, this experience doesn’t seem real. But I remind myself that it is, however wild. I think to myself, “Wild places live on, and I am in one”.